I am writing this from a cabin in the rocky mountains of Colorado. (Can you call it a cabin if it’s got wireless internet and satellite TV? Probably not…) Anyway, we’re taking a family vacation this week, so I’ve been seeing some landscapes, plants, and animals I’m not used to. However, I got a pleasant surprise yesterday when we reached the end of a long hiking trail in the Mount Evans Wilderness. The terminus of the trail was a high, wide open meadow (elevation 11,500 feet) with scattered bristlecone pines and abundant blooming wildflowers. It felt much more like home than the steep wooded slopes we climbed to reach it. Many of the wildflowers looked like they must be related to plants I know from home, but I didn’t know what many of them were – with one exception. Pasqueflower (Pulsatilla patens) at 11,500 feet in the Mount Evans Wilderness south of Idaho Springs, Colorado. I sure didn’t expect to see pasque flower at 11,500 feet elevation! 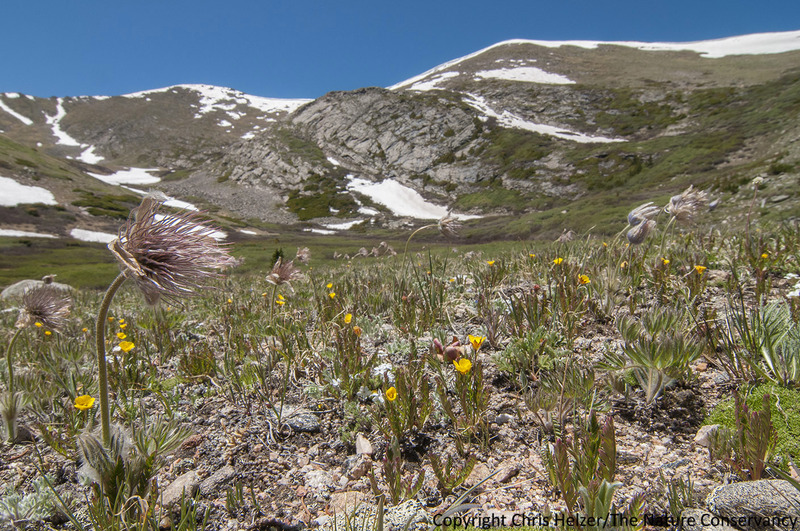 Can you believe a species found in the prairies of Illinois, Iowa and Nebraska also thrives way up in the alpine meadows of Colorado? That’s quite a range! Pasqueflower seedheads in the same meadow. 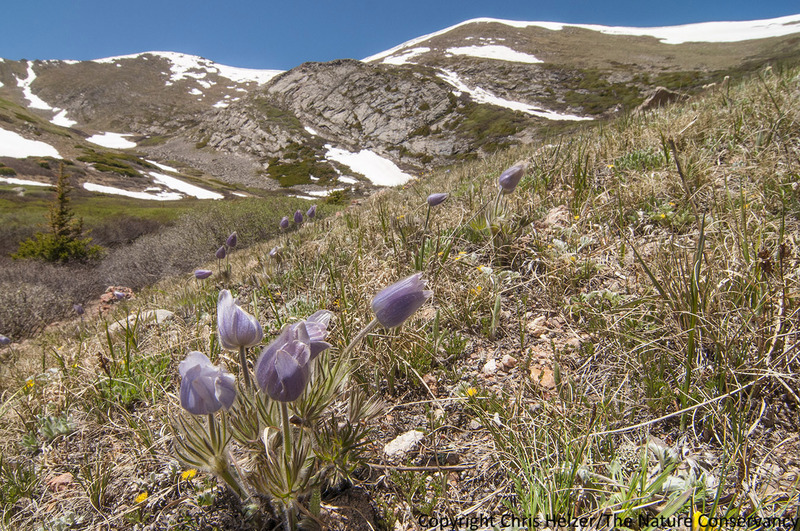 This entry was posted in Prairie Natural History, Prairie Photography, Prairie Plants and tagged alpine, anemone, colorado, mount evans wilderness, pasque flower, pulsatilla patens, rocky mountains, vacation by Chris Helzer. Bookmark the permalink. Lucky you Chris, what a nice place to go for vacation. Pulsatillas are beautiful plants and they are circumpolar, unfazed by elevation differences or national boundaries. Thank you, Chris, for doing this blog. A friend told me about it and I’ve been following you for a while now. It is sooo interesting and so enjoyable. Thank you so very much. Thank YOU, Gisela. That’s very nice to hear. I hope you continue to enjoy it! Amazing! I used to have the pasqueflower in my garden (northern Illinois). Lovely plant. Looks like a wonderful place to rent a cabin. I took have pasque flower in my garen in northern Illinois. I have to put cages around them or the rabbits, or maybe it’s the deer, eat them down to the ground. I have the worst time with critters. I have chicken wire cages all over my property. I have a book here, somewhere, that is a wildflower book of South Dakota that has some higher elevation flowers in it as well as a mountain one…somewhere. Maybe I can find these books and help with i.d. Wish you would bring home some cold air! The Pasque flower is an amazing flower. We have it in the lowlands to the tundra in Alaska too! You should collect a few seeds to bring home and grow them into plants for your garden. If you do, then every time you walk out into your garden you will feel like you’re back on vacation.